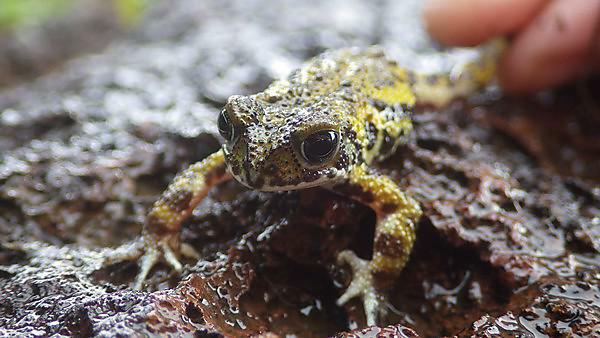 A fungal pathogen which has led to the extinction of entire species in South America has been recorded for the first time in critically endangered amphibians in India. Batrachochytrium dendrobatidis (Bd) can cause the lethal disease chytridiomycosis, and is considered a significant threat wherever it is found. It was first discovered in the Western Ghats Biodiversity Hotspot, designated one of the eight most important global hotspots and one of the three most threatened by population growth, in 2011. But new research led by the University of Plymouth has found it for the first time in caecilians, the critically endangered Amboli Toad (Xanthophryne tigerina) and the endangered white-lipped Cricket Frog (Fejervarya cf. sahyadris). In a study published in Royal Society Open Science, scientists say there is currently no evidence to suggest the bacteria has developed into chytridiomycosis within the Western Ghats. However, they say the situation should be monitored closely in future and that conservation plans within the region should aim to minimise the risk of the bacteria being spread more widely. Christopher Thorpe, a postgraduate research student in the University’s School of Biological and Marine Sciences, led the study alongside Plymouth colleagues Dr Mairi Knight, David Pryce and Lewis Davies. It also involved researchers from the Department of Infectious Disease Epidemiology at Imperial College London, George Washington University, and the Tata Institute of Social Sciences in Maharashtra, India. “The Western Ghats is home to the highest concentration of rare amphibians in India and a number of species which feature on the International Union for Conservation of Nature’s red list. To find Bd among them is a cause for concern, although we have no way of telling at the moment whether this is a historical infection or something that has developed more recently. The Western Ghats is a chain of hills that runs north-south for around 1,600km along the southwestern coast of India, and part of it has been declared a UNESCO World Heritage Site. Scientists from Plymouth have been working in the area for several years, and recently published a study calling for rocky habitats to be protected in order to give endangered amphibian species a great chance of survival. For this study, scientists visited 13 sites at a range of altitudes in the northern part of the region, and tested 118 individuals from 21 species. 79 per cent of the amphibians tested positive for Bd, although it was not currently at a sufficient concentration to have developed into chytridiomycosis. However, researchers did find infection intensity was much lower in coastal regions where temperatures are higher, which could now and in the future provide a refuge from high intensity infection. The full study – Climate structuring of Batrachochytrium dendrobatidis infection in the threatened amphibians of the northern Western Ghats, India by Thorpe et al – is published in Royal Society Open Science, doi: 10.1098/rsos.180211. We promote an international outlook, with field courses to Spain and Mexico, so that you can learn about conservation in other parts of the world. Diverse courses in an ideal location. Find out more about what biology courses we can offer you.